I'm not a huge fan of beef. In fact, I don't buy it except in veal form for use at home. Occasionally, I'll have a burger, but otherwise I'm more of a chicken and pork meat eater. A friend of mine found this unacceptable. He decided to bring over some steaks the size of my head to convince me the shady underbelly of the meat world could make a nice home in my kitchen. I wasn't allowed to cook the steak, only to watch and eat. Preheat a large skillet on the stove top and the oven to 350F. Massage the meat in butter. This didn't really do anything, as far as I could tell, other than allow my friend to get right up in that giant slab of red meat's business. Most of the butter ended up in the pan after the steaks were added to it dry. They were lightly salted and peppered first. They are cooked on high until medium rare, then put in the oven for 15 minutes. Take them out, let them rest. They ended up medium well done. 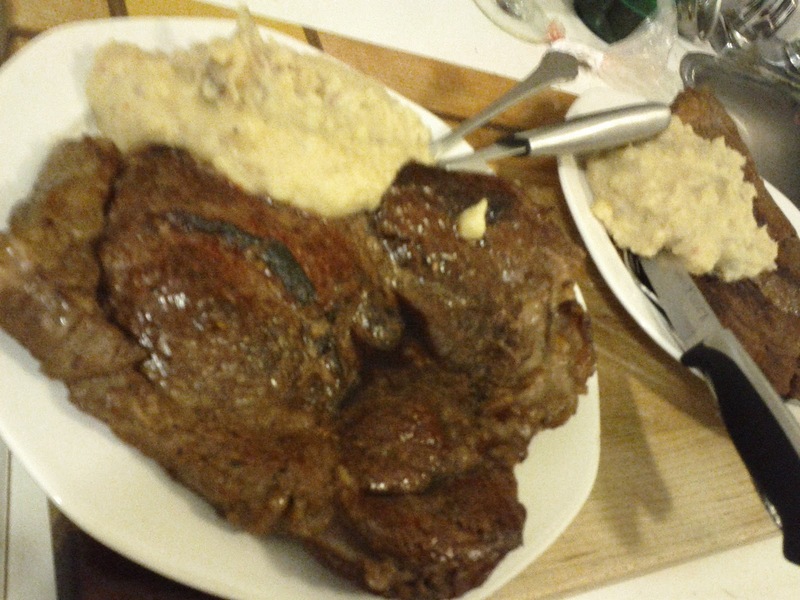 Banned from steak, I made mashed potatoes. 6 yellow fleshed potatoes boiled in salted water until soft. Mash them up with some butter, milk, a dried chili, 1C of old cheddar and the drippings from the steak pan. Delicious! Oh my. That is a giant steak. I did not eat the whole thing. I did go back for more potatoes though, they were obscenely delicious. Meat is good, but I don't think I enjoyed this any more than I would have a well cooked piece of chicken or one of my mushroom burgers. The potatoes benefited greatly from the beef flavour in a way that I didn't expect. Cheesy, spicy potatoes are already really good, but the beef juice kicked it up to a level I otherwise wouldn't have reached. So, you can keep your red meat, as long as I get the gravy and some of those tasty taters.